Apply proper grammatical conventions to written communication. Power Proofreading - Choose 8th grade then select; Eye It - Buy It, Kids' Quiz, The Young and the Clueless, or any one of the mixed practice exercises. Comparative and Superlative Quiz - use the pull down menus to see answers. Conjunctions Quiz I - use the pull down menus to see answers. Conjunctions Quiz II - Combine the sentences using the conjunction given in parentheses. use the pull down menus to see answers. The Need to Combine Sentences - Sentences have to be combined to avoid the monotony that would surely result if all sentences were brief and of equal length. This lesson is followed by three quizzes. Repairing Run-On Sentences - After each run-on sentence select the remedy that would best repair that sentence. Power Proofreading - Choose 8th grade then select; Word Workout, Eat Your Heart Out, Teen Time, or any one of the mixed practice exercises. Pronoun Case - The case of some pronouns depends on their function in sentences or clauses. This lesson is followed by an interactive quiz. Power Proofreading - Choose 8th grade then select; E-mail to HME-TV Staff, Sour Sid on Sports, You Solve it, Weather or Not, Animal Alarm, or any one of the mixed practice exercises. There is� or� there are? Present research findings in expository form. A Lesson in Expository Writing -The Personal Touch: - This lesson uses examples of such communication as a springboard for practice in expository writing. Expository Writing Tips! - The information was taken from "Blowing Away the State Writing Assessment Test" by Jane Bell Kiester available through Maupin House Publishing. Expository Writing Plan - Use this information to help create your essays. Organize written communication with clarity and cohesion. Different Types of Paragraphs in an Essay - exercise 4.1 - Identify each sentence as belonging to an introductory, body or concluding paragraph. Different Types of Paragraphs in an Essay - exercise 4.2 - Read an introductory paragraph and identify the (1) thesis statement, (2) context for the essay and (3) limitation of the essay to a particular area. Design and implement an appropriate presentation format based upon the audience and nature of the research. Creating a Power Presentation - handout; many ideas with scaffolding along the way to help students complete a project. Ten Tips for PowerPoint Slide Shows - create and deliver visual aids that complement and reinforce your message. Using Visual Aids Effectively - " most of us believe that a picture's worth a thousand words, and it is - but only if it's the right picture." 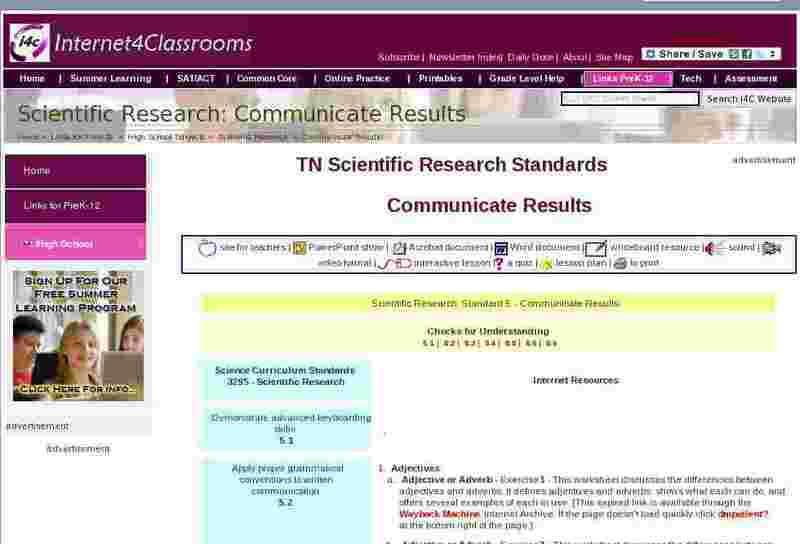 Present an effective and well-articulated oral report using audiovisual aids. Audio Broadcasts and Podcasts: Oral Storytelling and Dramatization - Each listener creates mental images to accompany the words and sounds that are broadcast, allowing these broadcasts to create a one-to-one connection that no other medium can match. The Function of Images in Text - The lesson will focus on three major ways - as example, as evidence, and as expression - that images can be used in a text. Information Literacy Exercise - example of a web page that should allow students to use both their critical thinking and critical viewing skills. Media Awareness - introduces grades 5-8 to the concept of images presented through the media, primarily advertising through print and on television. The unit is divided into three approximately 45-minute lessons. Prepare a technical paper for potential publication.